Sometimes it is a little slow but I think that is because of all the leagues that are loaded, I keep deleting levels as I get promotion higher up the pyramid so hopefully it will eventually speed up. Amazingly, I've only had a couple of serious injuries so far. Fingers crossed! Mid sussex league division 1 has 5 cups. So once I download the thing at the very beginning where do I put it in the files. This is probably a noob question but I honestly have no idea. Does it run okay though? The games between highlights run quick? You'll have to tolerate the slow processing. Have a book handy or surf the internet during processing. I've come to realise that you just can't not be a successful manager at this level. I ran a first-season holiday save without me as manager and the club went out in the first round of every cup and missed out on promotion. 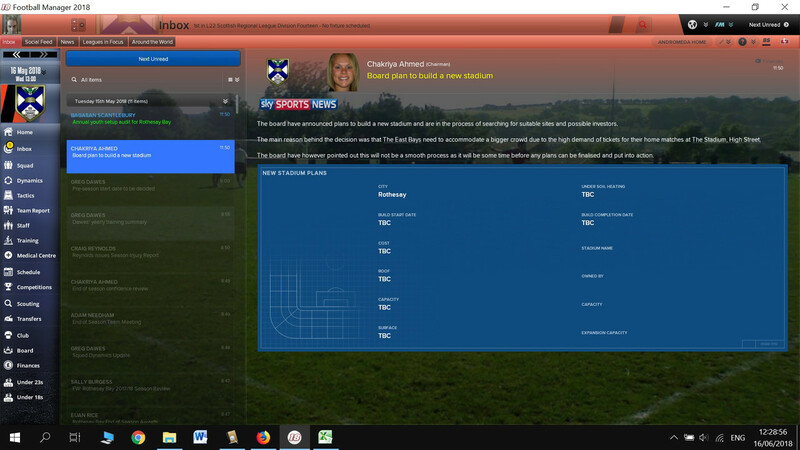 When I loaded up the live save and added myself as manager I gave myself a mere B licence, which has the interesting result that players don't listen to me in team-talks and , what ought to be significantly, most players I approach aren't interested in joining my club. So I've got a tiny (24) woefully imbalanced squad of kids to work with. I've got 6 decent strikers, a couple of decent DCs, no wingers and no quality in midfield. I experimented with dozens of formation permutations to try to put my best players in my Starting XI and have ended up with a ridiculous formation with 3 strikers (I mean strikers, not IFs or AMs, but P, AF, DF, TM roles). I've forced my full-backs into wing-back roles in order to use the flanks and by-pass my ineffective midfield (they can break up oppo attacks but can't create anything themselves). It ought to be a disaster, yet my 3 forwards get tons of chances most games and are scoring for fun. I'm not even conceding much at the other end. So despite what I thought would be severe limitations, I can foresee a clean-sweep season forthcoming. The main challenges will be injuries - I'll have to discipline myself to keeping training light, and internal dissent - as I noted last time, at amateur level - for me - even the weakest 15 year old fancies himself as a key player and everyone wants to play every game. The cups will be crucial to giving all my players enough game-time, and it's probably for the best that no one else wants to join us. Okay, first competitive match is up - let the games commence! I like to assign everyone, other than my U18s, a "backup" status. I don't have anyone assigned as "rotation," "first team" or "key player." I don't have any real evidence, but it seems like it cut down on players whining for playing time. There's always a few that still complain, but it seems better. Maybe it's just a placebo effect. And as soon as I posted this, one of my fan's favorite players complained and I couldn't justify sticking him in the current lineup and I couldn't placate him with a talk, so I had to release him before he upset the rest of the squad. Sad. They take it without complaining? I'm nervous of losing the dressing room before I've established myself. I'll give it a go then. Well, I should say that I believe I have already released all those with higher status as I signed new players with "backup" status. So I guess I haven't ever changed someone's status, just signed them originally with a backup status. I love my GKs name - Bienvenu Badibanga. I think my low reputation results in no one interested in joining me unless I promise them gametime. One dilemma I had was a 16 year old keeper arrived who is better than the established 36 year old club captain. Politically, I've kept the old keeper as club captain, hoping it'll placate him and his buddies, whilst giving VC and key player status to the kid keeper. So far so good. That's cool. I've just had my first-ever stadium sell-out. I say "stadium" - the capacity is 50. I like that the ME has given me a "stadium" with no seating too. Wow. That is going to be hard to earn money. Wonder if the board is going to automatically upgrade your beach umbrella, I mean stadium, after a season or two if you start selling out every match. Ha ha! We'll see. I'm not hopeful. Nae money, nae bother! I think I've also inadvertently stumbled onto the perfect tactic for this level. Previously I had a lone striker; now I've got 3. So the simple tactic is to have the other 7 players welly the ball up the park at every opportunity for 3 speedy guys to run onto. The defence don't know who to mark and they get overwhelmed. At some point someone will work out they need to sit deep, but for now it's fish in a barrel. Oof, pride comes before a fall! I've just lost 3 league games in a row. My first-choice XI are imperious enough, but we've been ravaged by injuries and my second-string are proving to be consistently inconsistent. I've just held a serious team meeting, and now I need to micro-manage to get us back on track. I have played with 3 strikers for a long time now. I know this is the data analyst camera but what settings do you have it on for Height and Zoom? My best player Mirza Sejdic left on a free yesterday as we're obviously playing at an amateur level, was pretty gutted and decided to see if i could offer him a contract back. He'd scored 16 goals and assisted 5 in 15 games from a SS role so I relied on him a lot, i decided to see if he would negotiate a contract and it let me offer him one. A few other first team players have left and when i've gone to talk to them straight away they have said 'I've just joined my new club' etc - but Mirza actually accepted the contract and in the space of 3 days had goen from us to another team and back, capped it off with a hat-trick in his first game back. He stays as top goalscorer in the league but his goals and average rating have reset on my stats which is frustrating but i really cant complain. yes I have sometimes been able to get players back straight away. Just beat my record win. I don't know - default, I guess. I don't use this angle (I stick to director cam and behind goal for replays) - I just took this shot to show the full pitch with no stadium. In my last save the Fairwarp stadium looked like Vanarama standard, so I thought you should see this. Yes, quite a lot! As someone else pointed out, it can be gutting when your goalkeeper or star striker is poached with Spanish timing, but I always try that trick and get lucky half the time. I think it helps that you've frequently praised the lad and you're ingratiated into his favourites menu. Kind of works both ways mind - in my first season finding my feet I'm often mid-table around February. What happens is (and you have to be observant here) my best rivals suddenly lose their best players and they tank, leaving me to ascend to the top with perfect timing! Cool. My record is 9 in this file. 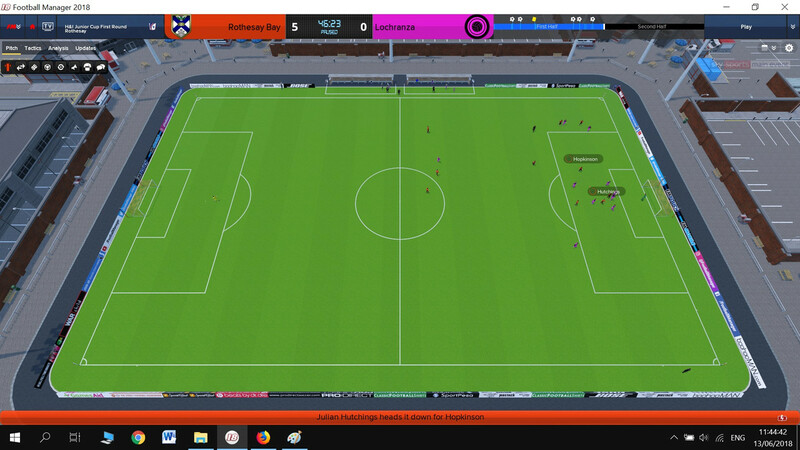 Ah fair enough, I like to play 2D but when i found this camera angle i changed it instantly i think its a good balance between the two because the players movements etc on FM aren't always appealing to watch but with Data analyst you're not too close so its good. I have not had any teams in my save turn pro. I think @phnompenhandy is the only one that's seen that, and he monkeys around in the editor, adding and removing teams, so it was probably something he unintentionally caused. Yes, very much this. I'm about to restart - I'll be intrigued to see if it happens to me again after even more noodling! That does put my mind at ease. When I get my new laptop (probably in the Autumn) I'll almost certainly download this file. New first season completed – not quite the stroll I expected. The league record was blemished by a run of three defeats during a period of heavy injuries and suspensions. It’s interesting that without consciously changing any variables, this save seemed to have 3x as many as my last one. I went out of one cup 3-4 in a jammy encounter where we scored 2 own goals and missed a 90th minute penalty. To follow up on another bizarre note, we came 8th out of 10 re. home attendances despite having a 100% sell-out record, i.e. 50 fans turned up to every match. Given that our monthly finances usually amounted to + or – 100 quid, I don’t see any finances to change that. In a nice touch, in this save all the grounds at Level 22 are just pitches with no stadia. All my backroom staff bar the physio defected over the course of the season. I replaced them but I can say that the facilities and human resources are so poor as to contribute nothing to player development. I did at least get a good group of 15 and 16 years olds – 3 go straight into the first team and the rest allowed me to ditch some of the inadequate back-up players. Here’s a screenie – the names won’t mean anything to you but it’s pretty much the same file you’re using just with place names that mean a lot to me personally. Now for the World Cup – in both worlds! A couple of old bus shelters would suffice, to be fair. @phnompenhandy that's a real life scottish structure ? No, not at all. It's my fantasy. Real Scottish clubs are further up the pyramid but in the lowest Sussex levels I let my imagination run wild. Struggled to fend off vultures offering cash money to my boys whenever anyone hits a bit of form. 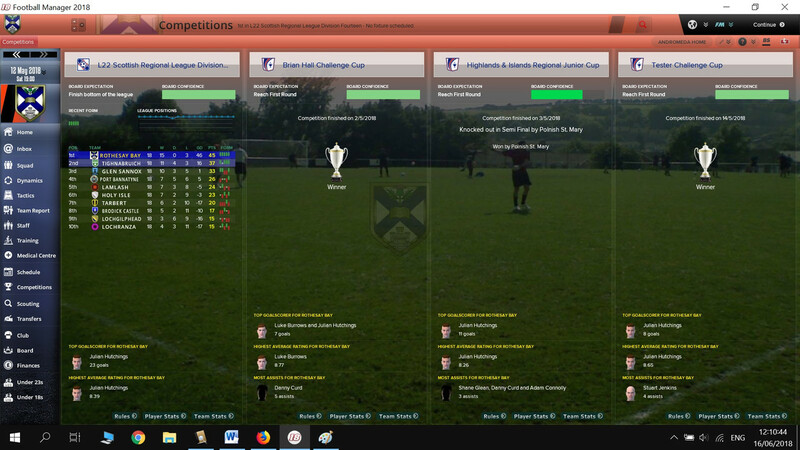 Spend a lot of time setting up friendlies to keep players match fit and assess incomers - brought in over 40 across the season; currently have a squad of 25 (four academy youths due to be released). Can't keep older boys who just want to play every match and I can't offer them that. Exhausting way to manage, but great! Here's a tip for hanging onto your best players. I've realised that you can offer your AMATEUR players a CONTRACT for no money, no terms and no date! If you do that another club can't just poach them - they need your permission for a "transfer" which you of course reject. Be careful though - I'm finding that every player demands key player status, so only do it with your actual key players. Chagossian & Maruitian Association FC seems to be quickly becoming my most threatening adversary. They were promoted with me from MSFL div 5 to div 4. Last season, 3/4 of the matches against them were 1 goal nail-biters which I managed to win. 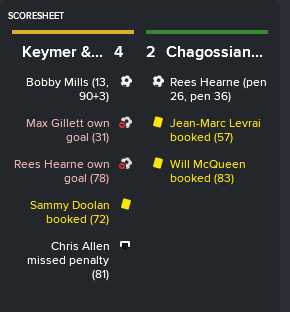 On an 81-game unbeaten streak, our first match against them this season - they finally beat me 2-1 after being awarded THREE penalties (managed to stop the first one). I don't think the opposing teams were awarded three penalties all last season. Oh well, felt good to finally yell aggressively at the team that they were awful and played like a bunch of three-legged turtles. Hopefully, they take it in the spirit in which it was intended. Yes, in my saves C&M get repeat promotions every time and seem THE power in Mid-Sussex. If you're besting them then you're good all the way up to Sthn Combination level. JJFM - Andromeda skin. Only available by friending their Facebook page. Quick question. I just started a new save in the Combined Counties League, managing Guildford. It seems that I am only able to make non-contract offers to players. The club is semi-professional. What am I missing? While your club is semi-professional, your board is probably preventing you from offering part-time contracts until your finances improve. Just guessing, but that's usually the issue. K&H looked good early and scored first on a beautiful route one followed by a powerful finish. Then C&M were awarded a penalty to tie it up, 1-1. K&H scored on a soft header during a corner kick scramble, the C&M keeper managed to get his fingers on it first so they scored it a weak own-goal. Shortly after, C&M were awarded another penalty to tie it up again, 2-2. Oh no, not again. After a bunch of even play, K&H finally took the lead on another C&M own goal, 3-2. 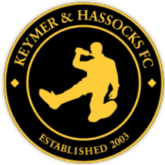 K&H were picking up the pace and were rewarded a penalty for their efforts, but their best penalty taker had already been subbed. K&H hit the woodwork and failed to put the game away. Finally, K&H got a late goal in injury time, 4-2 final. Whew! I didn't realize I had been holding my breath the last 15 minutes of the match. K&H and C&M are tied at the top of the table but K&H gets the nod due to goal differential. I fear there is no room for error in the last 7 matches of the season or C&M will take it all. ^ Looks a lot like my typical matches, one where we could do with VAR at this level. Is it just me - I have only one viable penalty-taker, my runaway top scorer. He misses 50% of the penalties! No, only one have decent penalty taker. His favorite shot is straight down the middle. Just been reading up about the 'Super Play-Offs' for being promoted into the National League North and South, only 6 teams get relegated from North and South, from this new season there will be 4 leagues below, instead of 3 so 4 champions are promoted and then only 2 of the 4 playoff winners will go up based on highest average points. I think this will be hard to replicate in a database!! Won all bar one match throughout the season! Damn fast too - having started again and just about to commence my Level 21 season I'll never catch you up! If I start a new game no matter which club I choose below level 8/9 they all seem to have that issue. Just wondering if it's an editor thing. Right, the clubs I've tried this on are all semi-pro (Combined Counties League and others at that level).